In 1614, in Madrid, Spain, reworks exploded to celebrate the beatification of Teresa of Avila. Even the king attended the Mass in her honor. The image of Teresa displayed at this event portrayed her holding a palm leaf in one hand (virginity) and a golden pen in the other (eloquence). Only thirty-five years earlier, she had been under scrutiny by the Inquisition. The papal nuncio had called her “a restless gadabout, a disobedient and contumacious woman who invented wicked doctrines … and taught others, against the commands of St. Paul, who had forbidden women to teach.” In between, in 1588, only six years after Teresa’s death, Fray Luis de Léon had her works published, an event that would seem to con rm the legitimacy of her writing. But the following year the Inquisition inaugurated a campaign to have her works banned. Challenging male privilege was unacceptable, as was the very idea that learned men would take instruction from a woman or publicly acclaim her as a teacher of prayer or doctrine. How quickly things change. Some four hundred years later, on September 27, 1970, Paul VI declared Teresa of Avila a Doctor of the Church, noting the extraordinary action of the Holy Spirit in her teaching on the inner dynamics of prayer. Naming the first female Doctor of the Church was an astonishing departure from tradition. He defended this choice of a non-ordained woman by noting that Teresa exercised the priesthood of all the faithful bestowed in the waters of baptism. Four women—Hildegard of Bingen, Catherine of Siena, Teresa of Avila, and Thérèse of Lisieux—have been honored with the title “Doctor of the Church.” But what does that title mean and what do these women mean for us today? 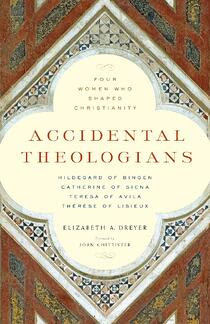 In Accidental Theologians, Elizabeth Dreyer examines the history-changing effect each of these women have had on our Church and our world. For a limited time, this book is 30% off in our store with the discount code AVILA30. This entry was posted in Faith on October 15, 2018 by CSSF.